Ok. I admit this blog is going to turn into a rant pretty quick because there seems to be a lot of ways to screw up a fairly simple horticultural practice—tree planting. Since Arbor days are happening/happened everywhere around now, its a good time to talk about how to plant trees. First let me state some simple and useful guidelines for a successful tree planting. -When at all possible, plant trees bare-root. Even washing the container media away. This allows for inspection and removal of root defects. -Take care in choosing the planting site. -Plant trees in a hole only deep enough to contain the root system, no double digging. -Fill the hole with soil removed to make it. Do not amend the backfill around newly planted trees—Do not put rocks in the bottom of a planting hole! -Plant trees away from turfgrass or other groundcovers. -Plant trees under the cover of a fresh layer of arborist chips. -Irrigate newly planted trees from the surface—Do not install U tubes or tree snorkels to irrigate deeply. An old planting detail from “a book of trees” . Several myths here: rocks at the bottom of the hole, amended hole, nursery stake still there when it does not need to be, etc. I guess this rant comes from the variety of tree planting specifications I have seen over the years used by municipalities, landscape architects, nurseries and others. There seems to be a need to use the latest product, method or modification to site soils in order to make a fancy planting detail. Simpler is better and research by Universities has not verified most of the “innovative” approaches seen in planting details. The first step in planting a tree is to chose the tree you want to plant. While this seems simple there is a lot that goes into tree selection. Setting aside personal choices, it comes down to selecting a tree that is healthy and free of defect. The potential candidate tree should have no signs or symptoms of disease, a naturally developed canopy unfettered by nursery pruning (especially heading cuts), and has few or no root defects. Initial superficial examination of the root collar in the nursery can eliminate some trees with circling or girdling roots. However, when the tree is planted root washing will reveal the entire root system and as Dr. Linda Chalker Scott has shown in this forum, root washing allows for rapid establishment in site soil. When at all possible chose the youngest tree you can for the new site. Young trees have fewer root defects, and we have the advantage of training them (structural pruning) from an early age. Young trees establish rapidly and will often outgrow older, boxed trees. The larger the specimen that you plant, the more chance for establishment problems such as settling, drying out, root rot or just slow growth. Planting trees from seed is ideal but most gardeners don’t have the patience to wait and seedlings, and seedlings do not give the option of using cultivated varieties that impart horticultural value, such as predetermined flower color, disease resistance, and known form (canopy shape and size). Once the tree is selected, purchased and root washed, it is time for setting it in the ground. The first step is choosing a good planting site. A good site for a tree is somewhere that provides adequate soil volume for its roots to expand and for its canopy to expand. Many trees in urban settings fail to achieve their potential because they have restricted spaces to grow in. Chose a location in full sun. Unless you are planting a species that grows well in shade or needs protection from the environment, most trees will grow best in a sunny location. While trees are forgiving of most soil conditions, they will not grow well in compacted soils. If this is all that is available, break up compacted soils before planting. Consider the ultimate size of the tree you are planting, and imagine it attaining that size in your planting site. Avoid sites that have close proximity to buildings or hardscape. One of the most frequent problems with trees is that as they attain mature size they conflict with the infrastructure at the site. Dig the hole for your tree so that the roots are very slightly above the grade. Do not double dig! While double digging has its proponents, there is no research-based reason for destroying soil structure– it is a disaster for tree planting. When a hole is dug too deeply soil will always settle after planting and irrigation resulting in the tree being planted too low in the ground. The root collar is buried and this is a predisposing factor for disease. The hole should have undisturbed soil under the roots. The hole only needs to be as wide as the root system. While many planting details show wide holes these are not necessary in most garden sites. If the site is compacted, wide holes can give temporary advantage to a newly planted tree, but the width of the hole will be the size of the “pot” the tree will have to grow in. So it is better to modify the site first to take care of compaction and then you will not need a wide hole. Root barriers were very popular and are still specified today. They actually do not usually achieve thier goal of preventing surface roots and protecting infrastructure. 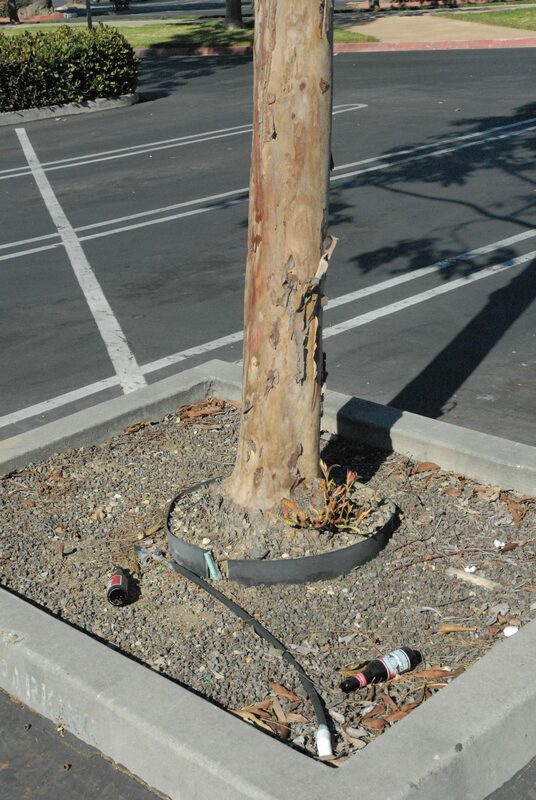 Trees outgrow root barriers and they result in increases of landscape trash/pollution. Root barriers can also create root defects such as circling and girdling roots. Do not install root barriers, if you are tempted to do so you are likely not choosing a good site to plant a tree. Cover the roots with backfill from the hole. Do not modify the backfill. Research does not support adding amendments to planting holes for trees. The native soil is what the tree will be growing in ultimately, and there is no reason to modify it. If the soil at your site is so bad that it needs to be changed, this should be a site-wide soil modification that will cover all the area the tree roots will explore up to its maturity. Most gardeners are not able to do this. Roots rapidly expand beyond the planting hole within months, so the time and benefit derived from an amended planting pit is minimal. Adding amendment, especially organic amendments to backfill can also be disastrous for trees. The organic material may utilize nitrogen in the soil and lead to a deficiency in the newly planted tree, worse, it may break down and cause anaerobic conditions in the bottom of the planting pit. Avoid amending planting holes! Never place rocks in the bottom of the hole—this does not create drainage, but creates an interface that prevents it. A “lollipop” Tree. Note the very skinny un-tapered stem, lack of temporary lateral branches and retention of the nursery stake–all bad…. Also note the tree snorkel lurking to the left. Kudos for keeping turf away but not far enough away. If you have selected a good tree, it will stand without staking. There are three reasons for staking: support; anchorage; and protection. Support is sometimes necessary when a tree is cultivated with a long un-tapered trunk and a lollipop crown. Lollipop trees are often sold in nurseries as they resemble small trees. Trees trained in this manner, will not stand without staking. Loose staking allowing trunk movement will foster development of caliper so the tree can eventually stand without supportive staking. 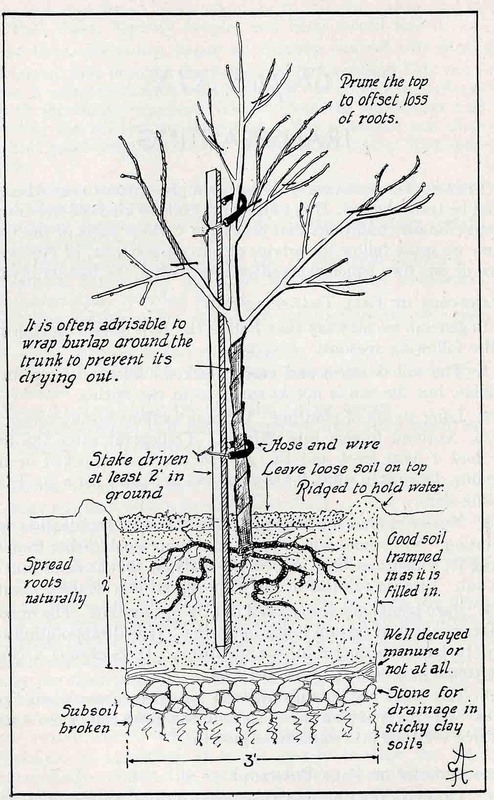 Anchor staking is used for trees that experience high winds and “staked out” with guy wires and a non-constrictive collar. Protective staking is analogous to placing bollards around a tree prevent impact from machinery or cars. 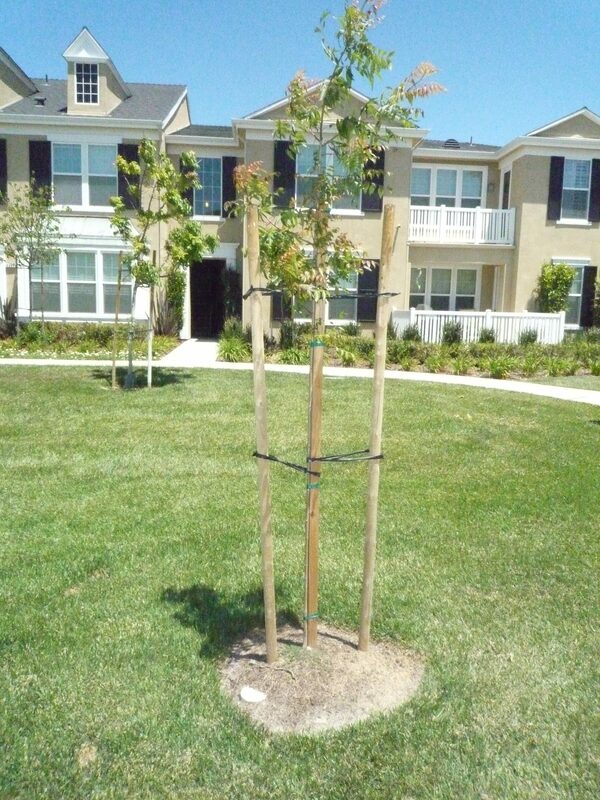 Always remove the nursery stake at the time of planting and provide any additional support the tree may need. Many Cooperative Extension services have publications on how to stake a shade tree. Avoid planting trees in lawns. Turfgrass and trees conflict with each other. Trees shade turfgrass which results in a thinning sward and increased disease prevalence. Turfgrass slows the growth of trees in an attempt to limit their shading effects. Turfgrass is a very competitive water user and trees will be deprived of moisture and nutrients if turfgrass is present. If trees must be planted in lawns, maintain at least a 1 yard radius around them with no turfgrass. Aeration/Irrigation snorkel tubes do not help trees and result in landscape pollution. Note the original nursery stake still in place and the supportive stakes should have been removed long ago. Mulch needs to be replenished. It has become a common practice to add irrigation or aeration devices to tree plantings. Sometimes called a tree snorkel these plastic 4 inch U tubes are buried below the root zone. Kits can be purchased from Box stores, and architectural details have been drawn specifying their use. Work by UC researchers showed that oxygen does not diffuse far from aeration tubes. So utilizing tree tubes to increase air flow is suspicious. Some planting details specify adding irrigation to the tubes to force a deep rooted condition in the tree. This places water below the root system, which can dry out and compromise establishment—not a good idea… Worse of all tree snorkels are sometimes installed with no purpose at all other than that was what the planting plan indicated. This is a needless practice and results in landscape pollution. Long term, tree snorkels are ugly, easily broken and provide no useful function to an establishing landscape tree. It is not in the nature of trees to proliferate absorbing roots deep in soil and snorkels will not change a tree’s genetics. After the tree is set in its hole, and backfill settled in with water, apply a 4 inch layer of arborist chips as far out from the trunk as feasible—at least several feet. The chips will modify the soil improving, chemical, physical and biological properties while conserving moisture from evaporation, preventing runoff, and germination of annual weeds. 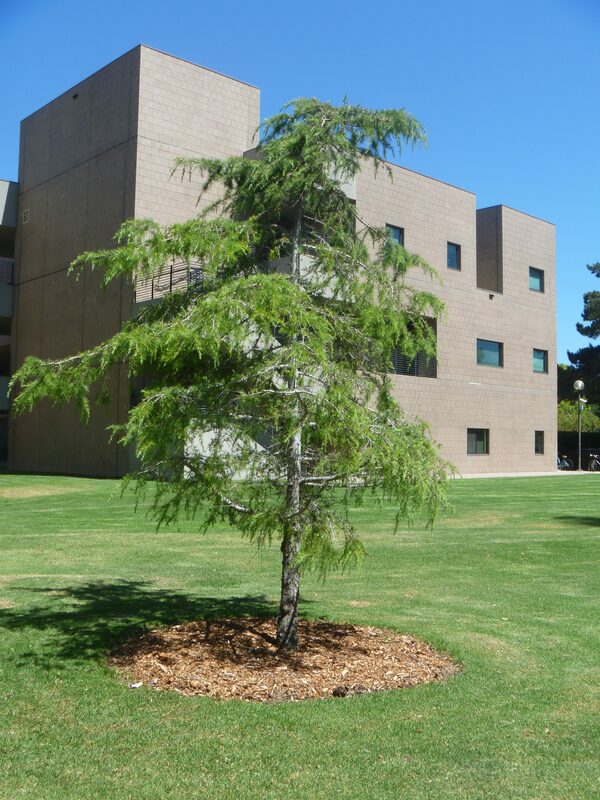 Generally trees thrive under mulch as it simulates litterfall, or accumulation of organic matter under their canopies. Replenish the mulch as it deteriorates. Finally apply irrigation as needed through the mulch from the surface of the soil. This will help establishing roots, leach salts, and move mulch nutrients into the soil profile. 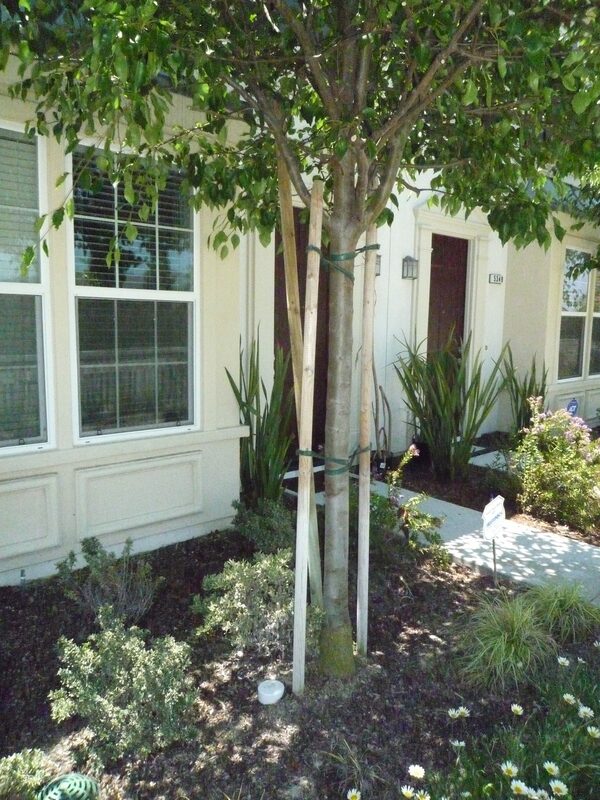 Avoid companion plantings near the main stem of the tree and avoid piling mulch around the tree stem. Following these guidelines will lead to a healthy and useful shade tree that provides its many services for decades. Ann Arbor has had an aggressive street tree planting program the last several years. At first they hired a contractor to water the trees and trees were planted with an odd green bag around the bottom of the tree. I found these online and they claim to be a slow drip water delivery system. These always looked suspect to me and more recently they are simply asking residents to water new trees. I looked and looked at the picture showing a “tree snorkel”. Please explain. I don’t understand what you are referring to. I’ll answer for Jim as I’m not sure he gets messages about comments. It’s that vertically-placed, white plastic tube. Great! This is a very helpful summary. Thanks! Thanks for the great article, I’m wondering what about timing? Temperature etc.